Some implantable medical devices, such as pacemakers, defibrillators and resynchronization devices, can be hacked for malicious intent. If you have an implanted device made by St. Jude Medical and use the [email protected] transmitter, this is for you. In early January 2017, both the Food & Drug Administration and the Department of Homeland Security issued warnings about the implanted devices made by St. Jude Medical. At the same time, St. Jude introduced a software patch to rectify the problem, while we warned that this patch only fixed one of the most serious vulnerabilities.. In early February 2017, the Department of Homeland Security validated our analysis and issued a second warning about St. Jude medical implants. In this notice, St. Jude Medical (now part of Abbott Laboratories) acknowledged that more models of the company’s implantable medical devices are subject to cyber security threats. This development supports ongoing claims that St. Jude Medical + Abbott have not recognized or addressed all of the devices’ major vulnerabilities, raising questions about best practices for disclosure and patient safety. We continue to believe that there are cyber security vulnerabilities with St. Jude Medical’s [email protected] transmitter that, if exploited, could allow an unauthorized user to remotely access a patient’s implanted cardiac device. Do you know if your St. Jude pacemaker is safe? In our view, the announced fixes do not appear to address the larger problems, including the existence of a universal code that could allow hackers to control the implants. If you have a St. Jude implantable cardiac device contact your doctor, cardiologist and/or primary care giver to find out if you are at risk. April 28, 2016: Abbott Laboratories announces its agreement to acquire St. Jude Medical for about $25 billion. August 26, 2016: Muddy Waters Capital, in conjunction with MedSec, warns about the cyber security weaknesses of St. Jude’s pacemakers. January 4, 2017: Abbott Laboratories closes its acquisition of St. Jude Medical for about $25 billion. January 9, 2017: The Food & Drug Administration and the Department of Homeland Security confirm Muddy Waters’ and MedSec’s findings and issue alerts about the implanted devices made by St. Jude Medical. Simultaneously in connection with the government’s conclusion, St. Jude acknowledges weaknesses in the [email protected] system and issues a software patch to patch cyber security risks. January 9, 2017: Muddy Waters says that the announced fixes do not appear to address the larger problems, including the existence of a universal code that could allow hackers to control the implants. January 9, 2017: Matthew Green, an assistant professor for computer science at Johns Hopkins University and a part of the Bishop Fox team, called one vulnerability "probably the most impactful vulnerability I've ever seen." February 7, 2017: The Department of Homeland Security updates its cyber security alert with respect to St. Jude Medical’s pacemakers and defibrillators. In sum, St. Jude (now part of Abbott Labs) acknowledges that more models of implantable medical devices than previously disclosed are subject to cyber security threats. The Chairman of St. Jude Medical stood to take home +$500 million. The Chief Executive Officer of St. Jude Medical stood to take home $35 million. Q: Why did Muddy Waters and MedSec depart from standard cyber security disclosure protocol with respect to their research on St. Jude Medical? A: Muddy Waters and MedSec were alarmed by the risks posed by flaws in St. Jude’s medical devices. Muddy Waters and MedSec did not believe St. Jude would take action to remediate the problems. For those reasons, they decided to bring the issue to the public’s attention to ensure that St. Jude Medical responded appropriately and with urgency. 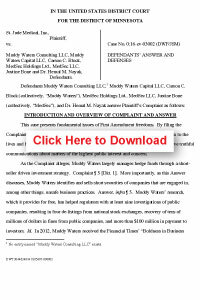 Muddy Waters worked with MedSec, a cyber-security research company formed exclusively to serve the health care industry, to analyze and form its opinion on St. Jude Medical and the company’s implantable cardiac devices. MedSec had contacted Muddy Waters after largely completing an 18-month cyber security assessment of major manufacturers’ pacemakers and defibrillators. MedSec’s research revealed vulnerabilities with St. Jude Medical’s [email protected] transmitter that, if exploited, could allow an unauthorized user remote access to a patient’s implanted cardiac device. Once St. Jude filed its lawsuit, Muddy Waters brought in independent cyber-security experts to review the findings. While vulnerabilities were discovered in implantable cardiac devices by a number of manufacturers, the risks posed by St. Jude Medical devices were by far the most concerning, because St. Jude Medical devices, unlike the devices of other manufacturers, relied on wireless transmissions. MedSec and Muddy Waters believe that St. Jude Medical has known about cyber security problems in its products since at least 2013. Furthermore, in 2014, St. Jude’s cardiac devices were the subject of Department of Homeland Security investigation into cybersecurity flaws. Yet, to the knowledge of Muddy Waters and MedSec, very little action was taken by the company. For these reasons, MedSec and Muddy Waters decided to make the major conclusions of the cyber-security findings public; all sensitive and detailed information was stripped from the public report to protect consumers. This approach represents a departure from standard cyber security protocol but was deemed necessary in order to bring the public’s attention to the issue and ensure that St. Jude Medical responded appropriately and with urgency. Copyright © 2019 Profits Over Patients, All Rights Reserved.